REACT T has been specifically designed to provide valuable feedback and performance improvement solutions to owners, operators and service providers of commercial properties. 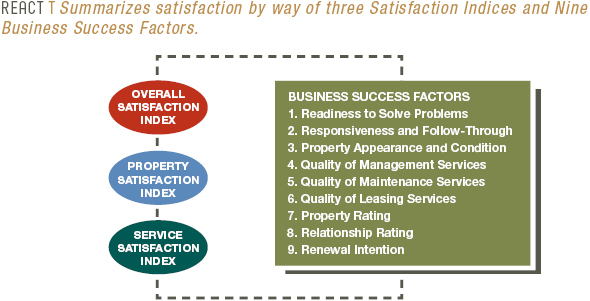 The REACT T process will transform your organization’s Tenant services from a policy to a behavior…resulting in higher levels of Tenant satisfaction and retention. 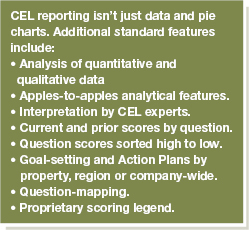 CEL has a variety of reporting options, and we tailor your REACT Plan and reporting package to meet each individual client’s needs. We have discovered that for performance improvement to occur, REACT clients must be presented with a reporting level that matches their internal abilities to manage data, thus focusing on change. For validity and reliability, REACT includes a proprietary reporting and analysis process. CORe provides timely access to comments so you need not wait until a survey’s conclusion to address important response issues. Quick response is a key tenet of excellence, and CORe access to comments allows you to read and address noted issues quickly. You control access, tiered by user levels; and Associates can access, copy and/or print key survey information and reports 24/7 from any location – nationwide and worldwide. CORe integrates responses from surveys completed online and via printed documents, aggregating survey response data. From the CORe secure website, it takes just one click to access current and prior years’ reports. CORe – available on demand! Contact a CEL Associate for more details.